In Bangladesh, hundreds of thousands of people are routinely uprooted by coastal flooding, many making a treacherous journey to the slums of the capital, Dhaka. In West Africa, the almost total disappearance of Lake Chad because of desertification has empowered terrorists and forced more than four million people into camps. It's a problem in the United States as well. An estimated 2,300 Puerto Rican families displaced by Hurricane Maria are still looking for permanent housing, while government officials have spent years working to preemptively relocate more than a dozen small coastal communities in Alaska and Louisiana that are disappearing into the rising sea. A December study by Columbia University climate researchers in the peer-reviewed journal Science projected that if global temperatures continue their upward march, applications for asylum to the European Union could increase 28 percent to nearly 450,000 per year by 2100. But so far, there's no international agreement on who should qualify as a climate refugee — much less a plan to manage the growing crisis. "These people fall through the cracks," says Erol Yayboke, a development expert at the Center for Strategic and International Studies who helped author a May report on forced migration. "It's hard for countries to come to a consensus on something like this." That difficulty took shape during the second and third weeks of June in the latest round of negotiations on the Global Compact for Migration and the Global Compact on Refugees, which are due to be adopted at the U.N. General Assembly this fall. When the compacts were first proposed in 2016, there was some hope among migration researchers and advocates that they could provide a platform for new international policies on climate refugees, which had gained prominence since the 2015 Paris climate talks. But that hope was quashed in March, when Louise Arbour, the U.N. official leading the migration compact — which, of the two agreements, was considered the more likely venue for strong climate language — told the European Union that the document would not grant "specific legal international protection to climate-induced migrants." Both compacts do make some reference to the climate. The latest draft of the migration compact calls on U.N. members to "better map, understand, predict and address migration movements, including those resulting from sudden- and slow-onset natural disasters, environmental degradation, the adverse effects of climate change" and "cooperate to identify, develop and strengthen solutions, including planned relocation and visa options" for climate migrants. The refugee compact stops much shorter, only mentioning climate as one of many factors that "may interact with the drivers of refugee movements." Ideally, the compacts should encourage countries to create new legal processes to document and manage climate migrants "so people can move before the water is literally lapping at their feet," says Nina Hall, a migration expert at Johns Hopkins University. As an example, she cited a plan in New Zealand to offer up to 100 special climate visas to Pacific Islanders — although that process is still in development and isn't likely to open for several years, she said. But the language in the compacts is too vague to spur much progress, she says, and in any case neither compact will be legally binding. "We have to be up front that the global compacts are not going to transform the landscape for climate migrants," Hall says. Climate refugees pose a number of unique challenges for international policymakers compared to those displaced by persecution, the traditional driver recognized by the 1951 UN Refugee Convention. While some people, like the Puerto Ricans displaced by Maria, are affected by a specific disaster, many others are forced to move because of slow-onset changes like sea level rise and desertification, which can make it hard to identify them as climate refugees. Researchers are still working to understand how climate change interacts with the panoply of other factors, including national security and local economic trends, that might prompt a family to move. At the same time, the majority of today's climate refugees are displaced within the borders of their own country, whereas the new compacts focus exclusively on cross-border movement. And for Pacific island nations that face a truly existential threat from sea level rise, there's no legal precedent to guide how they might relocate to new territory in another country — if they even want to move. Even a comparatively simpler effort — to relocate a community of fewer than 100 people in Louisiana whose island home, Isle de Jean Charles, has lost 98 percent of its land to sea level rise since the 1950s, to a new town 40 miles inland — has taken several years and cost $50 million and still faces setbacks, including complaints from the predominantly Native American residents that the state government didn't adequately involve them in the planning process. "The reality is there are tens of millions of these people, and we don't agree on what we can do about them," Yayboke says. Meanwhile, the wave of nationalism and anti-immigrant sentiment that has swept across Europe and the U.S. in recent years has made it a challenge for the U.N. to even get governments to follow existing refugee protocol, let alone expand it to cover an entirely new class of refugee, Hall says. "To get any progressive international policy, much less hard law, is almost impossible in today's climate," she says. "We're not going to get any kind of binding convention on displaced people due to climate change." The U.S. pulled out of the migration compact in December, citing concerns that it could impede the Trump administration's immigration agenda. While that means the final agreement will be missing any commitment from the world's number-one migrant destination, it does remove a potential roadblock to including climate-specific language, given Trump's disbelief in climate change. In any case, the global compacts aren't the end of the issue. A different U.N. task force that was established in the Paris climate agreement is set to deliver a new set of recommendations on climate refugees around the same time the compacts are adopted. 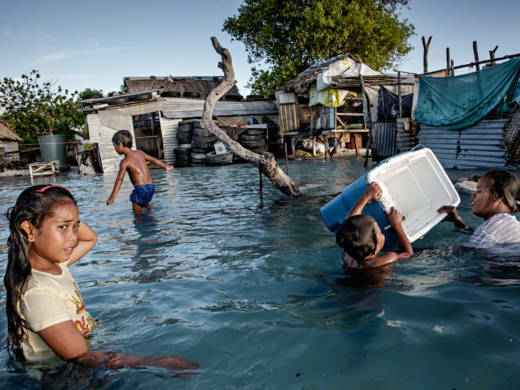 They will likely focus on measures individual countries can take to prevent climate refugees from being displaced in the first place, says Mariam Traore Chazalnoel, a climate expert at the U.N.'s International Organization for Migration. "Most people don't actually want to migrate," she says. "They would rather stay where they are. But they need the means to stay where they are." That could include programs to train and equip farmers for drought tolerance, she says, raise homes out of flood plains, and other measures aimed at increasing communities' resilience to climate shocks. Yayboke believes that development agencies need to step up funding for climate adaptation programs, which can help prevent displacement and reduce government spending on recovery from predictable natural disasters later on. "We are spending so much money on this stuff, but we're being totally reactive," he says. "There are proactive things we can do that we're just not doing." Few places are more illustrative of that problem than Bangladesh. According to the CSIS report, up to 70 percent of the five million people living in Dhaka's slums were displaced from their original home by environmental disasters. "The situation and scope of this problem is entirely new, and of biblical proportions," says Steve Trent, executive director of the Environmental Justice Foundation, which released its own report on Bangladesh in 2017. "It demands an entirely new legal convention. The global compacts are a start, but it's clear that they're not enough."